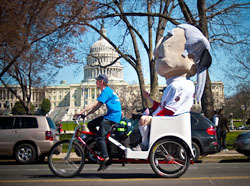 Capitol Pedicabs is Washington DC’s biggest and busiest Pedicab company. Our success comes from our commitment to client satisfaction. Whether it is a large corporate advertising and marketing campaign, an intimate wedding ceremony or a tour of the monuments for your family, our goal is to provide you with a memorable and entertaining eco-friendly transportation experience. Couple these beautiful machines with the fact that pedicabs are the greenest, most versatile and downright most fun form of transit, it's not hard to see why they’re so popular in nearly every major metropolitan area outside of the U.S. We’re trying to bring this experience to the most bustling areas of our nation’s congested Capital. 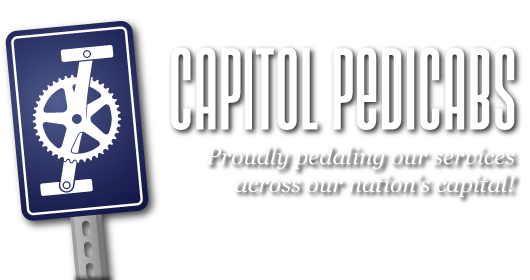 All content © 2008 - 2011 Capitol Pedicabs, LLC (except where otherwise noted). All rights reserved.